There’s a lot of stigma behind tattoos in the workplace. “They don’t create a desired image for the company.” “You can’t have any visible tattoos.” “You’re less likely to get hired for a job if the employer sees that you have a tattoo.” But why is a practice that’s been turned into a form of self-expression so frowned upon by companies? The thing is, my generation (the Millennials) is likely to be the generation of old folk that have lots of tattoos. Yes, we want an education. Yes, we want a nice-paying job so that we can have a good life. But it’s wrong to have that impeded by marks of ink. Tattoos don’t determine the value or the worth of the person applying for the job. You can have someone who’s heavily tattooed and someone who has no tattoos competing for the same position, and the person with the tattoos could be more qualified and a better fit for the job. The sad truth is that a lot of employers will just take one look at the tattoos and disregard that person, even if they have better qualifications. It’s an issue of the company’s image. 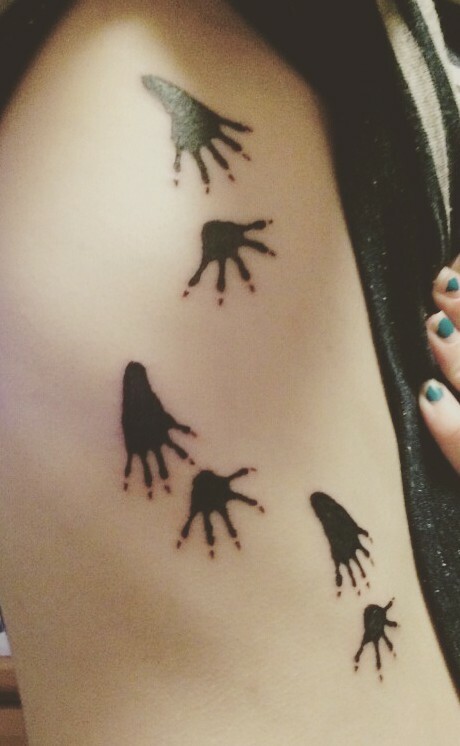 I’ll be honest with you: I’m 19 and I’ve got three tattoos now. I’m not ashamed of that–I’m actually quite proud. They all mean something to me. You wouldn’t know it just by looking at it, but my first tattoo represents one of the hardest things I had to get through. High school isn’t an easy time for a lot of kids and they all cope in different ways. I coped by taking what I went through and making it a permanent imprint on my body. It’s something I never want to forget, despite how horrible it was, because it reminds me of the amount of strength I have inside me. 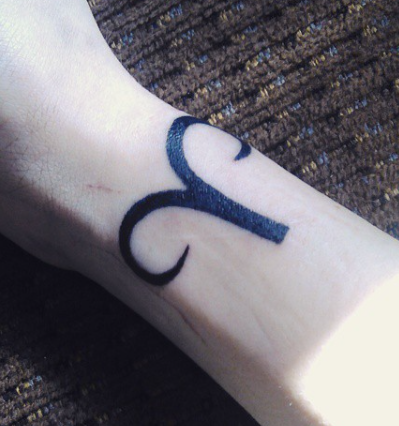 My second one is my astrological sign: Aries. It’s simple and small, but it represents a part of me. I’m a little lost on what I truly believe in and how I would define my beliefs–they’re a mix of a lot of different things. I don’t believe in everything astrology is about, but I do believe that my sign reflects my personality. It describes aspects of myself that I wouldn’t outwardly admit if someone were to ask me what traits I possessed and what my behaviors were. I believe that it is a part of me, so I put it on my body. I got my third one three days ago. It’s a set of raccoon tracks tattooed on my ribcage. 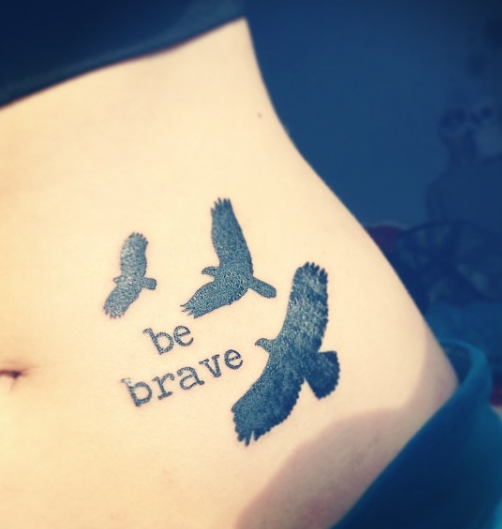 This tattoo… This is the one that got me thinking. Why did I get raccoon tracks? Because I have a huge heart for animals, and raccoons happen to be my favorite. The tracks represent a portion of my personality that I’m glad I possess, but I didn’t originally want it on my ribcage. Don’t get me wrong, I love how it looks, but my initial idea was to get the tracks lining my collarbone. The artist didn’t want to do it–he was afraid for me. Afraid for what would happen five years down the road when I went to “writing parties” to show off my work and mingle with other authors. I had thought about it a bit, but I wasn’t worried about it. The mindset of my generation is that tattoos are a form of self-expression, not something we should be afraid of and have to conceal from the rest of the world. To us, to me, they aren’t a taboo subject. They’re parts of us that we’ve chosen to represent on our bodies and be proud of. Piercings, clothing, etc… They all fall under self-expression. We choose to dress and look how we want because it reflects who we are inside. And we’re okay with that. Why can’t everyone else be? Next postWhat’s the Buzz About Bees? Kiera, this is a powerful post! At first I wondered whether the stigma was just a generational thing, a holdover from a time when tattoos were equated with criminality or at least unconventionality. I now wonder whether, in addition, some people are afraid of the stories that bodies can tell. You make very clear that your tattoos are connected to life stories and identity. I wonder if some people don’t want to face that — if they want clothing to cover over what are sometimes uncomfortable truths? If they feel safer somehow not having to see, to wonder, to ask about the stories? That idea saddens but doesn’t surprise me. Thank you for being so willing to share pieces of your story with us!